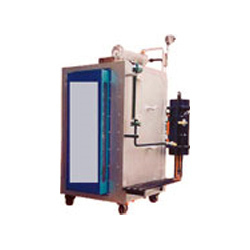 Our range of products include ammonia cracker unit. The Ammonia Cracker Unit offered by us is widely used in a number of heat treatment furnaces and is useful for generating combination of nitrogen and hydrogen. Cracking of ammonia is one of the most economical ways for On-site generation of hydrogen gas. For the same, a temperature of 85 deg. C is maintained in the electrically heated furnace. The centrifugally cast retort is fixed at the center of this furnace and filled with Nickel Catalyst. The Ammonia cracking takes place at this stage in presence of Nickel Catalyst. It has vital element i.e. 75 % Hydrogen and 25% Nitrogen Gas at Dew Point of (-) 30 Deg. C. As the Nitrogen Gas is a normally inert gas, this mixture is treated as pure Hydrogen Gas, making this an economical, tried, trusted and dependable source of on-site Hydrogen generation. For producing super dry gas, Molecular Sieves Filter is given after Ammonia Cracking Unit for reducing the ammonia down to 1-ppm level and dries gas upto (-) 70 Deg. C. to (-) 80 Deg. C.